Below is an article that appeared in Adweek about the McDonald’s VR Activation at SXSW. Link to the full article on Adweek.com – Adweek Article. A new virtual reality program McDonald’s is debuting at South by Southwest this week has the crowds of tech and agency people immersing themselves into one of the brand’s most iconic products: the Happy Meal. 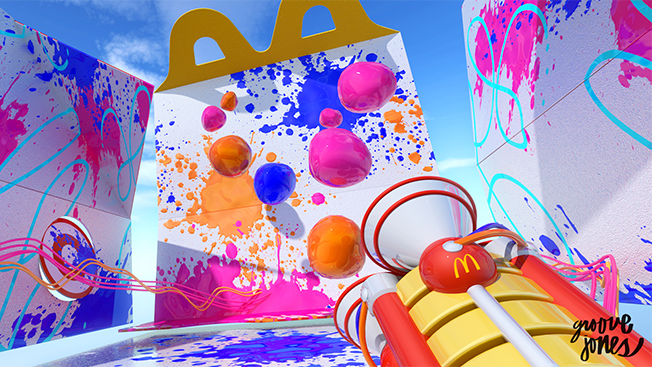 Using an experience built for the HTC Vive, users who visit the McDonald’s lounge near the Austin Convention Center can immerse themselves in a world where they’re tasked with painting a gigantic Happy Meal box with gobs of virtual reality paint. This isn’t the first VR play by McDonald’s. Late last month, McDonald’s restaurants across Sweden began distributing Happy Meal boxes that can turn into a VR headset reminiscent of Google Cardboard. The program, dubbed “Happy Goggles,” allows users to play a virtual reality skiing game. “I think with virtual reality we’re always looking for experiences for our consumers with emerging technologies and how those experiences can be on the forefront of the new definition of what’s fun,” said DeLu Jackson, corporate vp of global brand engagement at McDonald’s. Feel free to reach out to us if you have any questions about our VR capabilities and activation services.